This article describes a race-neutral policy proposal designed to increase business formation and success rates for young urban African Americans. The proposal suggests using local governments' taxing authority, in a manner analogous to tax increment financing, to create financial incentives for successful small business owners to employ, and then mentor and train as business owners, young urban entrepreneurs from deteriorating neighborhoods. The amount of financial incentive varies directly with financial success of protégés and requires the transfer of some of the mentor’s social (reputational) capital to the protégé. Business activity has created wealth and economic mobility for other ethnic groups, but has yet to play this role for African Americans. There are both obvious and complex historical reasons for this situation, but urban poverty cannot be addressed without greatly increasing the business formation and success rates for minority entrepreneurs. In a market economy such as ours, business ownership creates wealth (and employment), and business ownership should not be the exclusive province of the well educated. 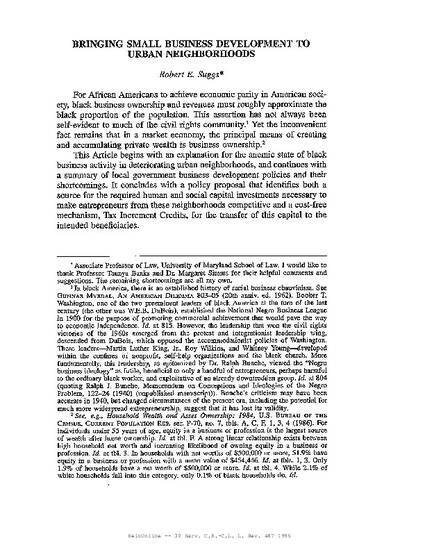 30 Harvard Civil Rights-Civil Liberties Law Review 487 (1995).